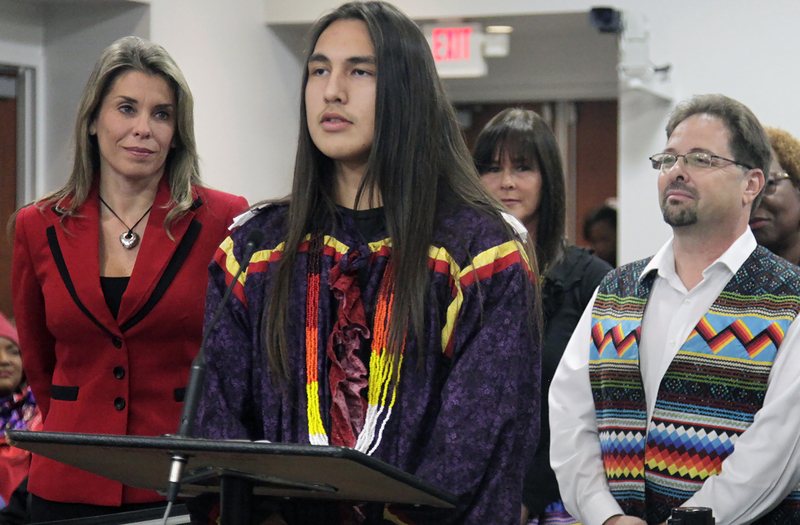 HOLLYWOOD — Tribal member Adakai Robbins spoke in support of a Native American Heritage Month resolution in December in front of the board of Broward County Public Schools. He took the moment to share stories about the struggles he’s experienced as a Native American living in a culture that can often be unwelcoming. Robbins is one of 17 Seminole students who attend Hollywood Hills High School, which has a student population of 1,924. “I feel like this colonized education system excludes proper Native representation and the effects it’s taken on us” Robbins, a 16-year-old-junior, said. Robbins, of Seminole and Navajo descent, has a deep passion for his Native American heritage and is not afraid to express it. During the Pledge of Allegiance at the school board meeting, Robbins, who wore traditional Seminole clothing, remained seated with his mother Sherry Robbins. He’s a former student of the private American Heritage School but says he feels more comfortable in the public Hollywood Hills. A strict dress code was one reason he switched schools. The sense of freedom to be able to wear beaded jewelry made him feel more at ease at Hollywood Hills. Robbins said what he’s learned about his culture isn’t found in school textbooks. He’s learned it from his relatives. Robbins said it’s a strange feeling not to see his culture represented in textbooks, when so many others are. Robbins was emotional when he explained to the school board and others who were in attendance that he had never voiced his feelings about his culture and heritage in such a public setting. He then read a poem he wrote for the occasion. Native American culture is often underrepresented or misrepresented in U.S. history books, but recently there has been some progress. For example, several states have proposed bills that seek to rename Columbus Day to Indigenous Peoples Day. In addition, two Native American women were elected to the U.S. House of Representatives for the first time in the midterms. There are still significant challenges. Oil companies continue to place pipelines on Native lands, despite disapproval and protest from Native tribes. Native American women are being reported missing at a higher rate than any other demographic in the country and many are found dead or never found at all. And there are regular news reports of Native students who continue to be discriminated against, ignored, and failed by the American school system. The board passed a resolution that celebrates the contributions Native Americans have made to the United States and acknowledges the injustices they continue to face. It says they should be recognized and honored during Native American Heritage Month. Although Native American Heritage month is in November, due to scheduling conflicts the resolution was on the agenda in December. Vice Chair Donna P. Korn presented the resolution. Tom Albano, staff assistant for Broward County Public Schools and former principal of the Miccosukee Indian School, continued the resolution. Albano then gave a brief history of Native Americans from the European invasion to the passage of Indian Removal Act and the Seminole Wars. Albano said two schools with the assimilation method of “kill the Indian, and save the man” were built in Florida for the Miccosukee and Seminole tribes. The Miccosukee school was located in the Everglades in Miami and the Seminole school was located on the Big Cypress reservation. Both schools have completely changed their teaching methods since they were first built. However, Albano said, there was never a tribal school established for the Hollywood Reservation in Broward County. (Seminole students represent less than 1 percent of the total Broward student population). This led Tribal members of the Hollywood community to attend schools within the melting pot of Broward, a situation with advantages and disadvantages, Albano explained. Advantages included being exposed to a diverse mixture of racial backgrounds, so Seminole students would be able to socially interact with people outside their culture. The disadvantage is that through the generations, Seminole children have often become more accustomed to American values. “Most of our Seminole students do not speak their Native language fluently and often struggle between their Seminole culture and traditions and the majority culture that surrounds them,” said Lided Cerda, behavioral specialist and equity liaison for Hollywood Hills High at the meeting. In the end, Korn was impressed with what Robbins had to say. And I have two hearts, one from each tribe, Seminole and Navajo.